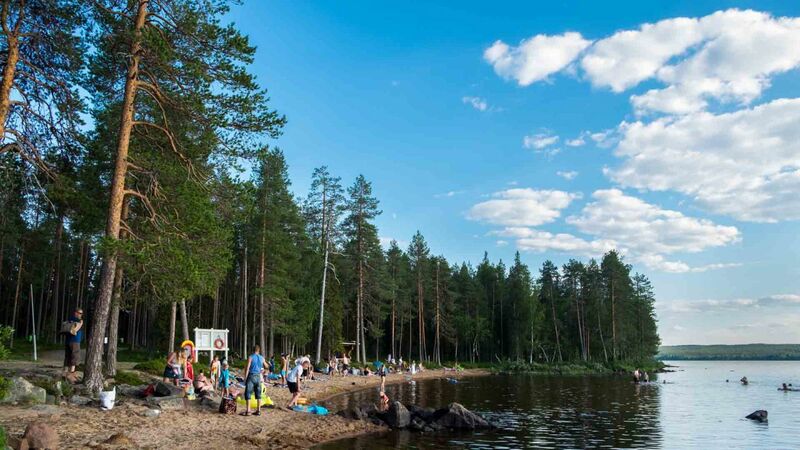 Beach and Lapland may sound like a weird combination to the uninitiated. But hey, let’s give it another thought! 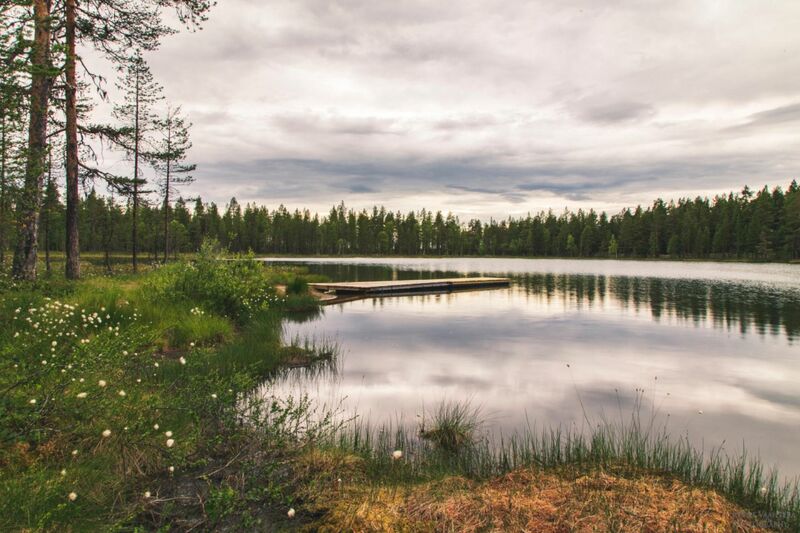 Lapland is a beach destination like no other, with pure, safe and refreshing water. You don’t have to fight your way through the crowds; instead, there’s plenty of space to find your own spot. Some days you may even have the whole beach all to yourself. Even the hottest summer days are comfortable, and on the chillier ones, you can just enjoy the peace of nature on the waterfront. On Arctic beaches, a sweater or a hoodie is just as acceptable as a bikini. And to top it off, you can sunbathe on the beach 24/7, thanks to the Midnight Sun. 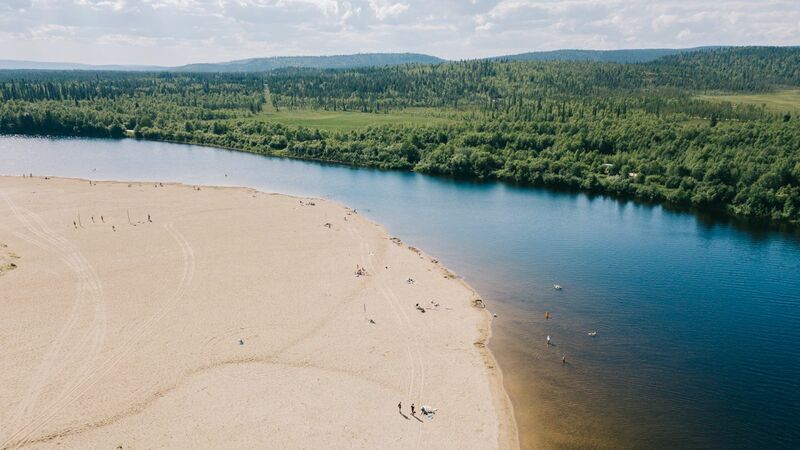 We’ve listed eight distinctive beaches in northern Finland for you to enjoy. Prepare to be surprised by these Arctic beach gems! 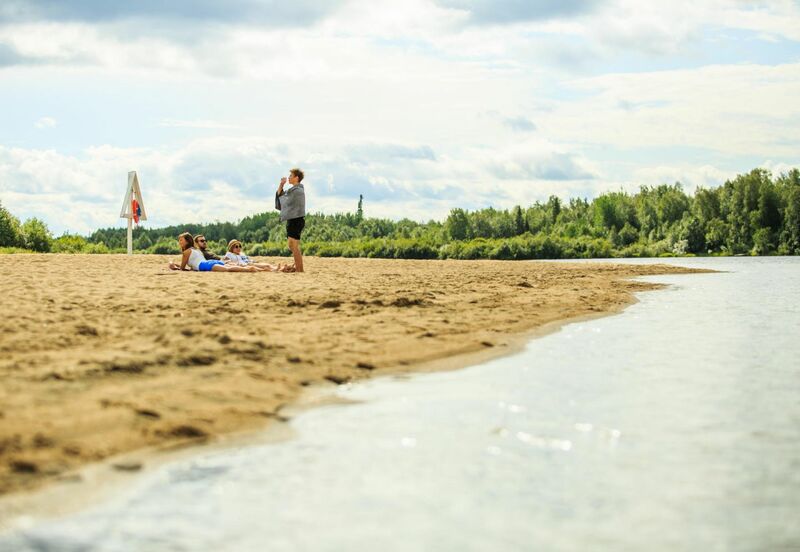 Just a stone’s throw away from downtown Ivalo, on the shores of the Ivalojoki river, lies a white sandy beach favored by the locals. On a warm summer day, people come to sunbathe and play beach volleyball, but most of the time, it’s all yours. Don’t be surprised if you come across a couple of reindeer swimming from the opposite shore to enjoy the beach life with you! 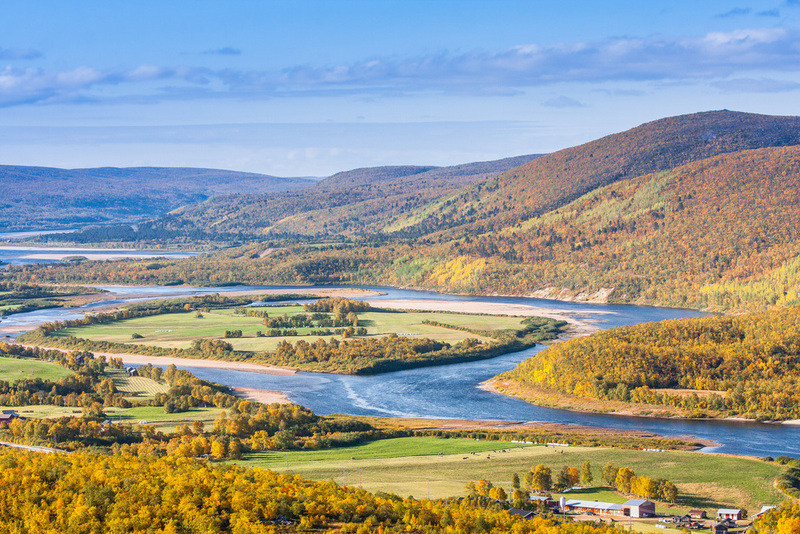 The capital of Lapland has a wide sandy beach only a five-minute walk away from the center. If you are more into laying on grass or huge rocks, this beach is for you. 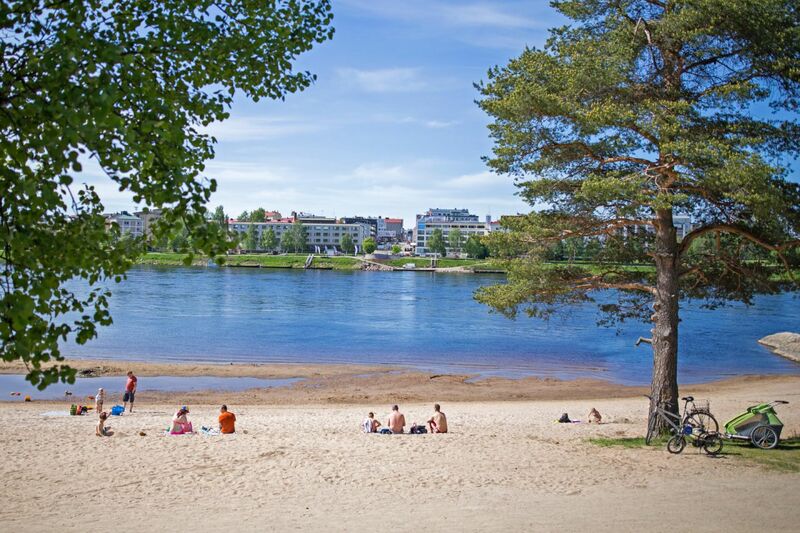 Even though the Kemijoki river has a fairly strong current, the swimming area is clearly marked and safe. The restaurant next to the beach has a nice terrace for refreshments. The beach borders a campsite with full facilities. The beach doesn’t sleep in winter, either, as it is transformed into a winter swimming site with a warm swimming hut. 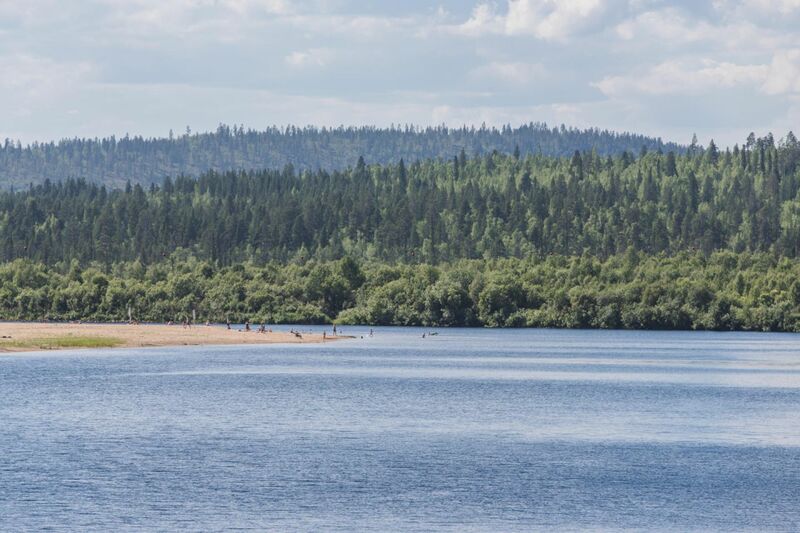 Another popular beach, especially among families with children, is found in the eastern side of Lake Norvajärvi, a 20-minute drive from Rovaniemi center. The sandy beach has both beach volleyball courts and petanque fields, and a hut with a campfire area. Be prepared to walk half a kilometer (5-10 minutes) from the parking place. 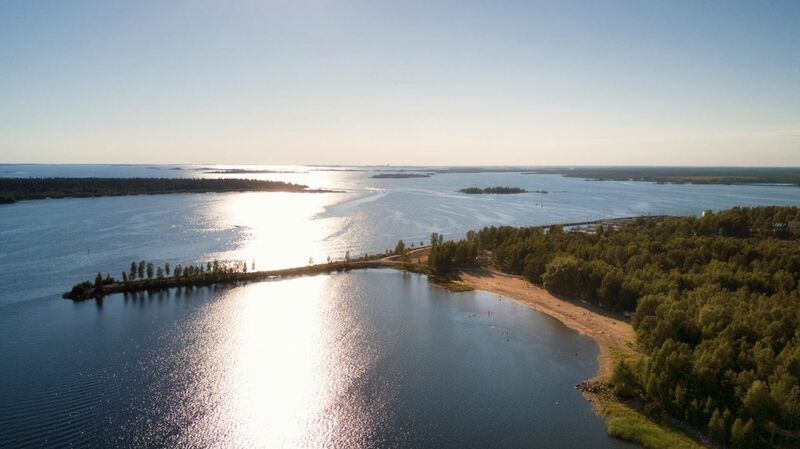 If you think the only real beaches are by the sea, you should head for Kemi. 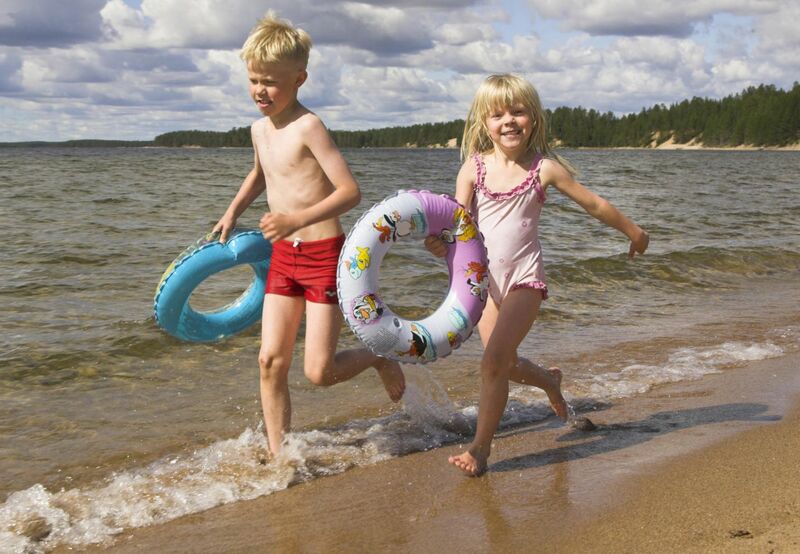 The Mansikkanokka beach is a wide sandy beach with safe and shallow water for swimming. 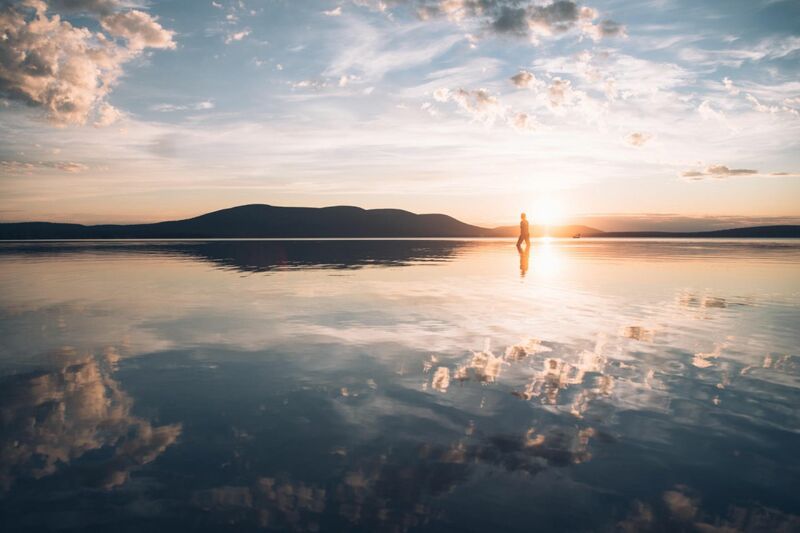 You can pitch a tent at the neighboring campsite or spend the night in a seaside glass villa admiring the Midnight Sun from the comfort of your bed. Kemi’s inner harbor is not for swimming but well worth a leisurely stroll. Enjoy a cup of coffee or dine on a terrace like the locals at one of the seaside restaurants. 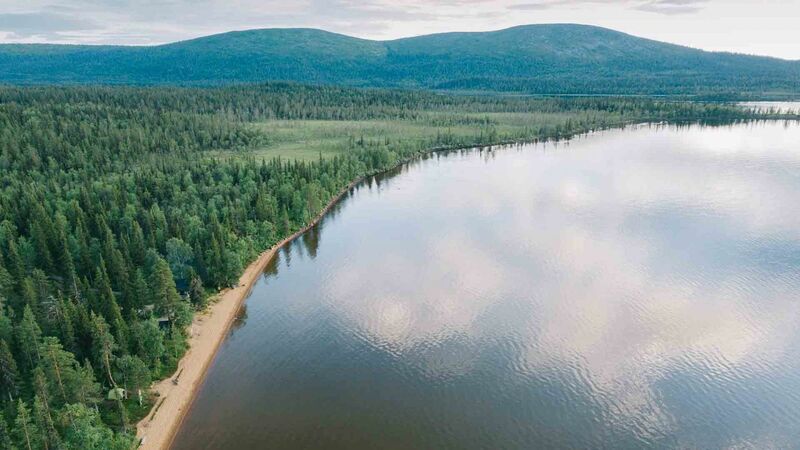 A long and narrow stretch of land by Lake Livojärvi is the home to the Säikänsalmi beach, also known as “Riviera of Lapland”. Don’t miss the crepes and other local delicacies served at the summer café by the beach. 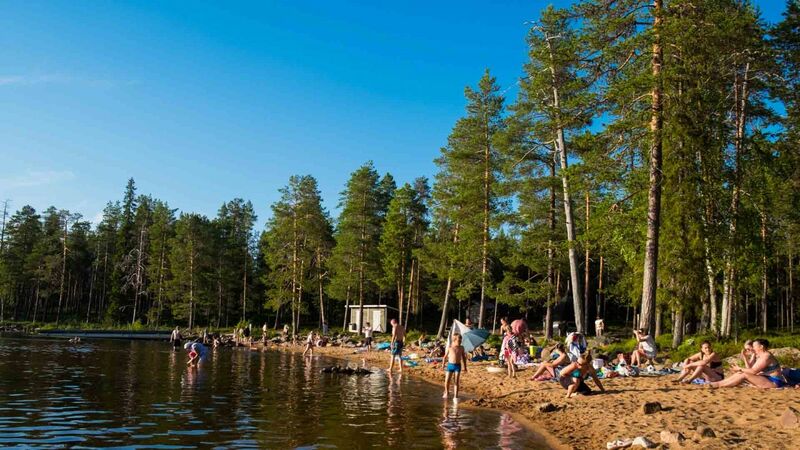 If you are looking for a bit more tranquility, head to the Kellinniemi beach on the south side of the lake with a lovely sandy beach and campfire to grill the most popular Finnish campfood: sausages! 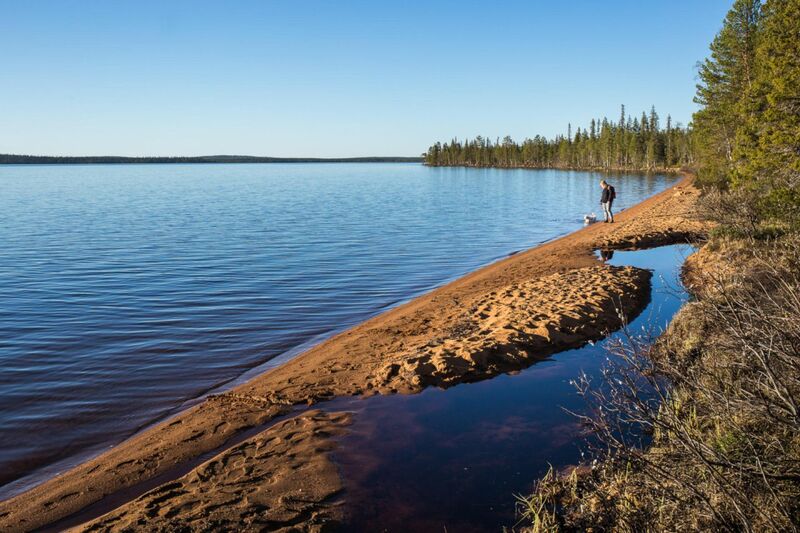 A half-kilometer path leads to the Punainen Hiekka (Red Sand) beach which gets its name from the reddish sand. A dip into Lake Pallas is framed by the hilltop scenery of Pallas fells. The rays of the Midnight Sun tinge the sand into various tones of red. The open hut right next to the beach is a comfortable place to stay overnight or warm up after a refreshing swim. 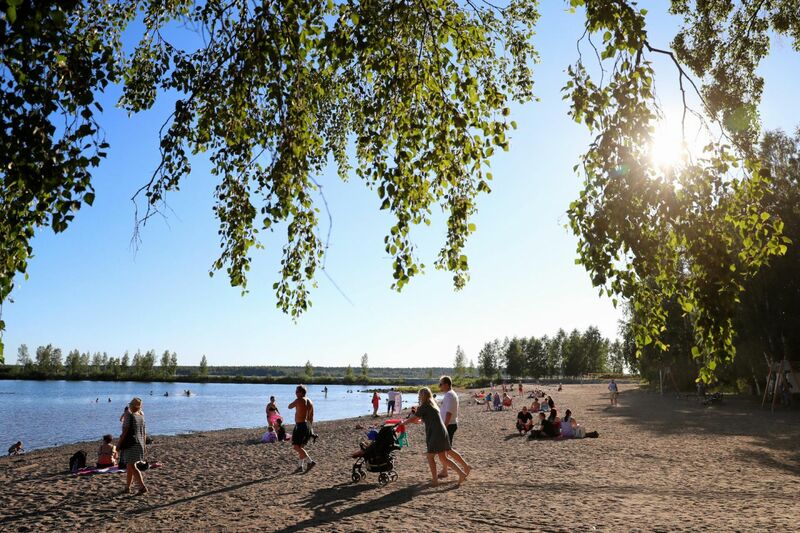 Pöyliöjärvi beach at the very heart of the city of Kemijärvi is full of activities. Alongside swimming, you can rent a SUP board, play volleyball or take part in the weekly yoga session. Kids will love the nearby playground. If you get thirsty or hungry, head to the summer café for a cup of coffee or refreshments. 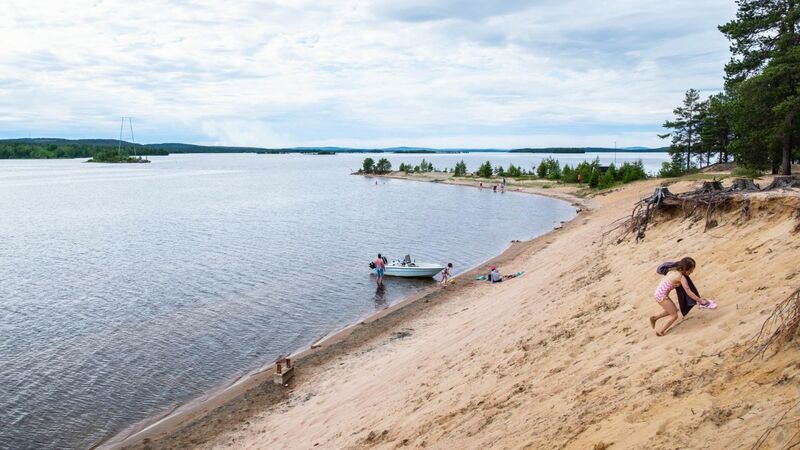 Kalkonniemi beach, about 12 kilometers away from Kemijärvi, is an ideal day trip destination even on a cloudier day. 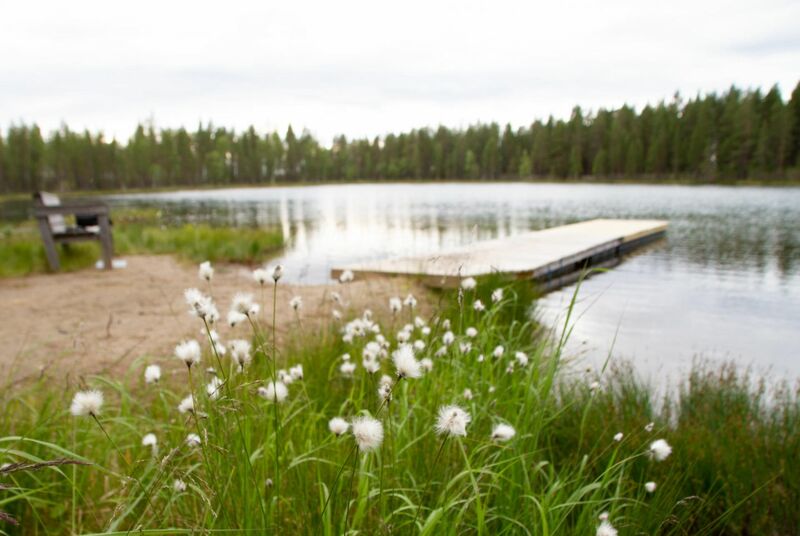 The sandy bank of Lake Kemijärvi is an enjoyable place to have a picnic with a fantastic view over the lake. On a clear day you can see all the way to the bridge on the other end of the lake. The beach is equipped with a swimming hut, campfire pit and outhouse. 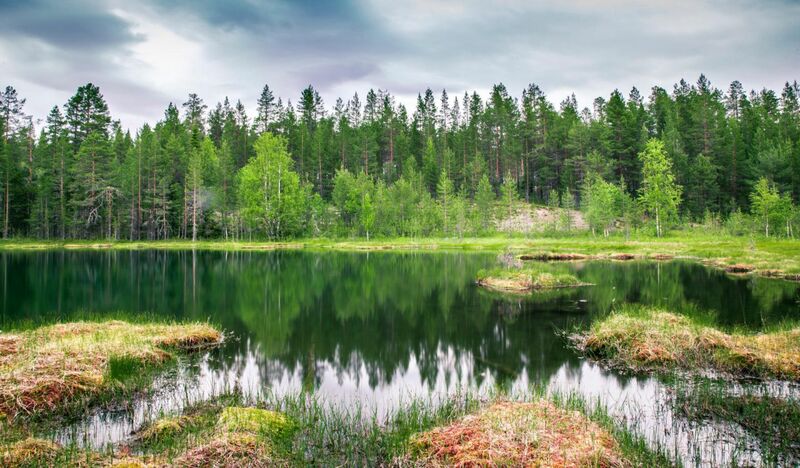 The tiny Lake Porolampi, with its turquoise water, is a real hidden pearl near the village of Kursu (30 km away from downtown Salla.) 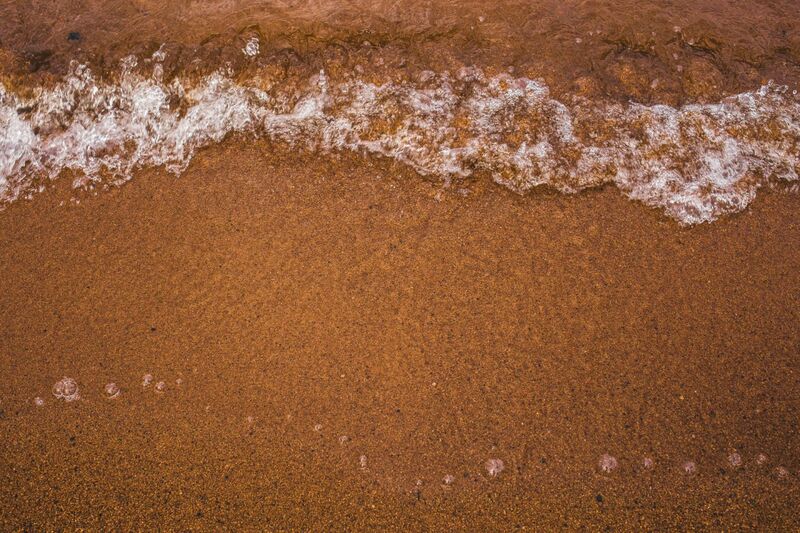 This small sandy beach has a brand-new dock, a bench and a swimming hut on the shore. On the opposite of the beach, there is a reindeer fence for gathering the reindeer in autumn. 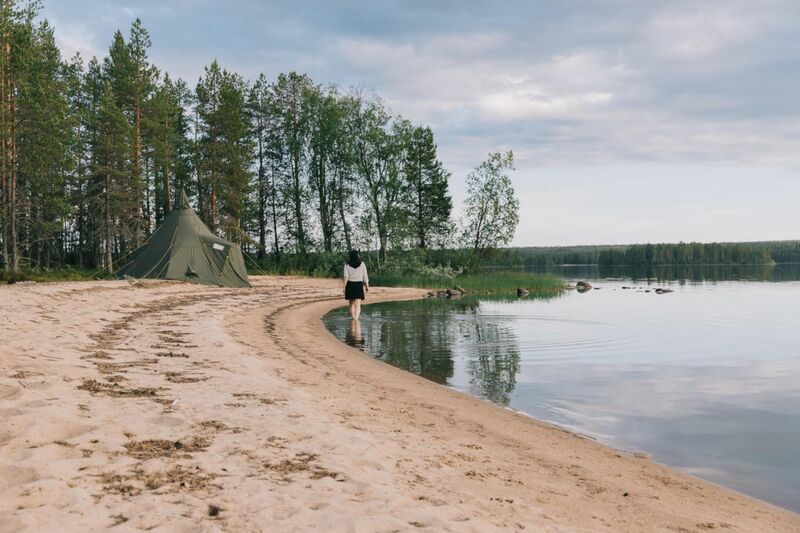 Truly Arctic beaches await you in the very northern tip of Finland along the famous Tenojoki River. There are numerous sand banks and dunes along the meandering river suitable for swimming. You can expect no crowds, but maybe the odd reindeer or two. The rugged fell scenery completes the Arctic experience.